Welcome to the NBA Playgrounds portal! 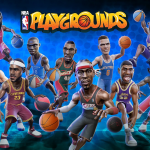 This is a central hub for all the NBA Playgrounds content here at the NLSC including news, reviews, feature articles, downloads and more. In Episode #244 of the NLSC Podcast: A discussion of NBA Live 19 and NBA 2K19 as we submit our Wishlists, an NBA Playgrounds event, the 2018 NBA Playoffs, and more. NBA Playgrounds Enhanced Edition has been released for the Nintendo Switch. It contains all post-launch content, and is intended to replace the original version. In this week's Monday Tip-Off, Andrew poses some basketball gaming questions that will ultimately be answered by the end of 2018. The Nintendo Switch will be receiving a new version of NBA Playgrounds, featuring all of the free updates the other platforms have received. Patch 1.41 has been pushed through for NBA Playgrounds, resolving an issue with the Roster Unlock DLC, and providing further optimisation.